The Castlevania series is finally here. Let the nostalgia and R-rated mayhem begin. Castlevania starts in the country of Wallachia in 1455. Across a field are skeletons set on pikes. Bats fly across the bodies, but a knife pieces through one of them. A woman stands before a rather imposing castle, no doubt belong to Dracula. As the doors slowly open, she enters and an opulent hallway greets her. The woman, Lisa (Emily Swallow), is met by a cloaked man. She tells him that she wants to be a doctor, but the only way for her to further her studies is to talk to him, Vlad Dracula Tepes (Graham McTavish), who has an impressive collection of scientific equipment. Immediately the two of them hit it off, with Lisa impressing Dracula with her thirst for knowledge and her open mind. It is clear that he finds her intriguing to the point of them actually being something more. Cut to 20 years later, and for all the good work that Lisa Tepes has tried to do for her town, the Bishop (Matt Frewer), a holy man with a superiority complex, has deemed her a witch. Tied to a stake, Lisa is being burned in front of a large gathering of townspeople. The Mayor questions the Bishop about what they found in her home, and the Bishop is quick to condemn all the scientific equipment, or “devil engines,” as nothing more than witchcraft. The Bishop believes that she was driven by Satan to pursue science, and according to the Archbishop, life in Wallachia should be “simple,” meaning, no science and a strong belief in God. On the stake, Lisa pleads to the sky. “Don’t hurt them. They don’t understand…They don’t know what they’re doing. Be better than them. Please!” The Bishop thinks she’s calling out to Satan, but in actuality, she’s calling out to her husband, Dracula. At that moment, Dracula returns to Wallachia and finds Lisa’s home a burned pile of rubble. A lone old woman approaches the remains of the house and Dracula asks her what has happened. She explains that the Bishop took Lisa and that she is being burned at the stake as they speak. He wants to know where she is being held in the hopes that maybe he can save her, but the old woman tells him that it’s too late. Dracula explains that he was traveling, as men do, slow and steady. He begins to cry tears of blood, knowing that he could have been there sooner had he just used his powers. Feeling the painful loss of his wife, he tells the old woman to gather up her family and leave the town; Dracula is about to get his revenge on. Disappearing in a whirlwind of flame, Dracula makes his way to the Cathedral. As the last bit of Lisa’s remains crumble to the ground, the townspeople celebrate the death of the supposed witch. 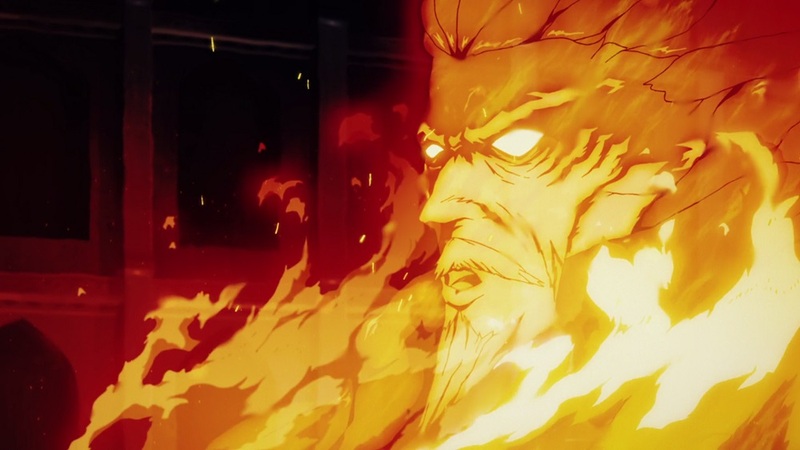 Just then Dracula appears in the flames and demands to know what happened to his wife. The Bishop believes that Dracula is not real, even though he is clearly in the flames, and tries to explain that Lisa was a witch. Dracula is quick to correct him, calling her a woman of science and nothing more. Completely done with the Bishop and the people of Wallachia, Dracula gives them one year to get their affairs in order and to make their peace. After that Dracula will wipe them off the face of the earth. At his castle, Dracula makes a plan to call forth a hellish army to take care of the town. From behind him the door opens and his son, Alucard (James Callis), comes to talk his father down. 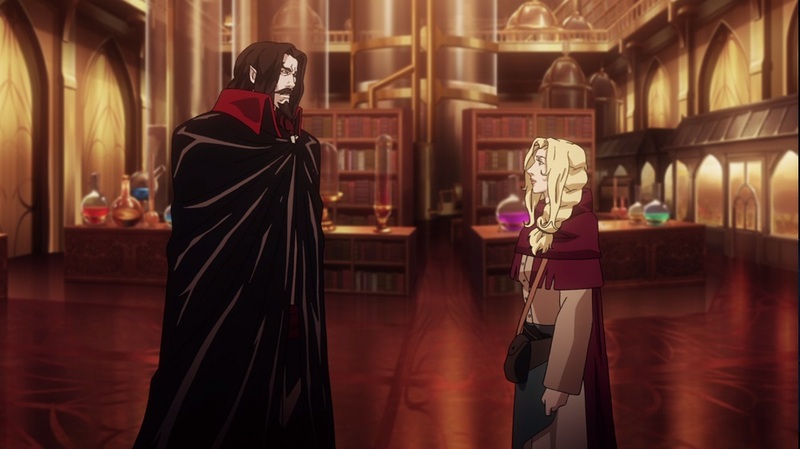 The conversation goes south fairly quickly, with Alucard warning his father that he will stop him and Dracula attacking him out of anger. It’s one year later and the townspeople are all gathered to the see the Archbishop to Targoviste Cathedral. Speaking to the crowd he recounts the events of the year prior, when they burned Lisa Tepes at the stake for being a witch. The Archbishop reminds them all about the vision they had of Dracula, and basically calls out Dracula for not keeping his promise. Of course, that is a huge mistake because Dracula is someone who keeps his word. Suddenly the clouds gather and it begins to rain blood. The ground shakes and the cathedral’s windows shatter, with some of the shards stabbing the Archbishop in the back. Dracula’s face appears in a ball of fire. Still unbelievably upset about the death of his wife, Dracula has come to rain down death and destruction on all the people. He’s not alone however. He has called on minions from hell to do most of his dirty work. Running the townspeople over, the minions rip them apart and set fire to the buildings. With the town now in ruins, Dracula commands the minions to seek out the other people of Wallachia in the nearby towns like Arges, Severin, Gresit, Chilia, and Enisara. “Kill for the only true love I ever knew. Kill for the endless lifetime of hate before me,” Dracula commands. It would be romantic if it wasn’t so genocidal. In a small town about 80 miles away from Targoviste and 15 mile away from Gresit, half-brothers/cousins Bosha and Kob are having a colorful conversation in a tavern about a goat and a man who really likes goats. Seconds later a man name Piter comes running into the tavern tells the patrons that Dracula’s horde is now descending on Gresit. Bosha doesn’t seem at all concerned about what’s going to happen, because he views it as payback to all the old families and great houses. From behind them a man sits alone at a table, listening to Bosha go one and on about the houses. Once Bosha brings up the Belmont’s the man’s ears perk up. Naturally, Bosha isn’t a fan of the Belmonts ether, something the unnamed man sees as a problem. Assuming that he is a Belmont himself, the man knows that he will be facing some trouble soon. While we don’t see what happened to Alucard after Dracula attacked him, we can assume that he does survive. 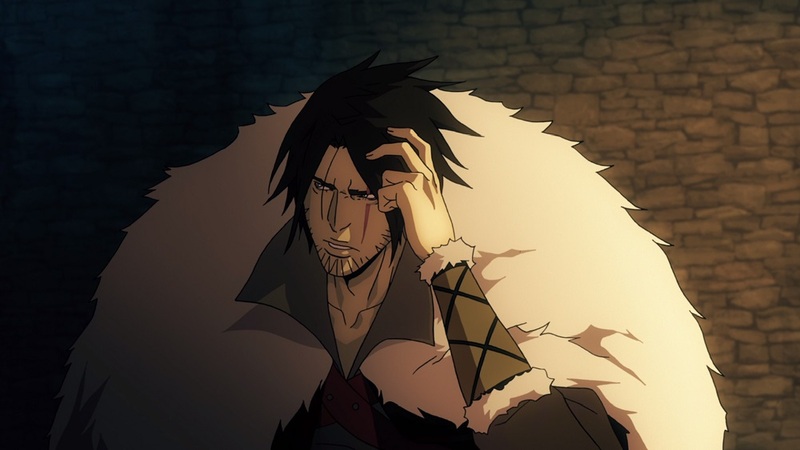 Knowing that he is more like his mother, Alucard will eventually meet Trevor Belmont and help him put an end to Dracula’s destructive rampage. I do like the addition of The Bishop as one of Dracula’s enemies and Matt Frewer does an amazing job. Hopefully we will get to see more of Lisa and Dracula’s relationship. As a Senior Contributor for GGA, I'm able to write about the things I love the most: geek culture and video games. I've been gaming since the 1980's and to see the evolution of games has been amazing and inspiring. What a time to be a gamer! 2019 Geek Girl Authority. All Rights Reserved.